View of the principal gateway into the Kaiserbagh, Lucknow. bl.uk > Online Gallery Home	> Online exhibitions	> Asia, Pacific and Africa Collections	> View of the principal gateway into the Kaiserbagh, Lucknow. 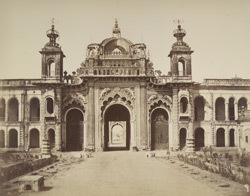 Part of a portfolio of photographs taken in 1858 by Major Robert Christopher Tytler and his wife, Harriet, at Delhi, Lucknow and Cawnpore in the aftermath of the Uprising of 1857. Kaisarbagh Palace built between 1848 to 1850 was founded by Nawab Wajid Ali Shah (r.1847-1856). His vision for the complex was of a paradise on earth, showcasing the riches of the royal court. Pathways through the various courtyards of the garden were intended to be indirect and zigzag to confuse visitors. This lack of clarity, together with guards posted at the numerous gates also helped to maintain a strict security within the palace. The Kaisarbagh Palace was the scene of fierce fighting during the Uprising of 1857 and after the capture of Lucknow by the British in 1858 it was ransacked and looted.